The window width rounded up to nearest whole number. For external mounting, include molding in width. 1-inch (25 mm) is automatically added to each panel for hems. The finished height rounded up to nearest whole number. Not including top and bottom hems. Total number of curtains (panel pairs) with these dimensions. 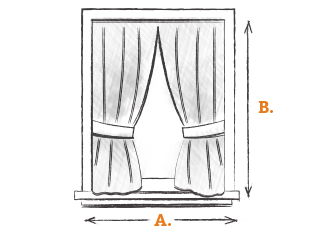 Amount of gather in the finished curtain. 1.5 times fullness is good for thicker fabrics, 2 times fullness is average for draperies, and sheers generally have 3 times fullness. The vertical repeat of a patterned fabric. Enter "0" if the fabric does not have a pattern. Decimals are permitted.